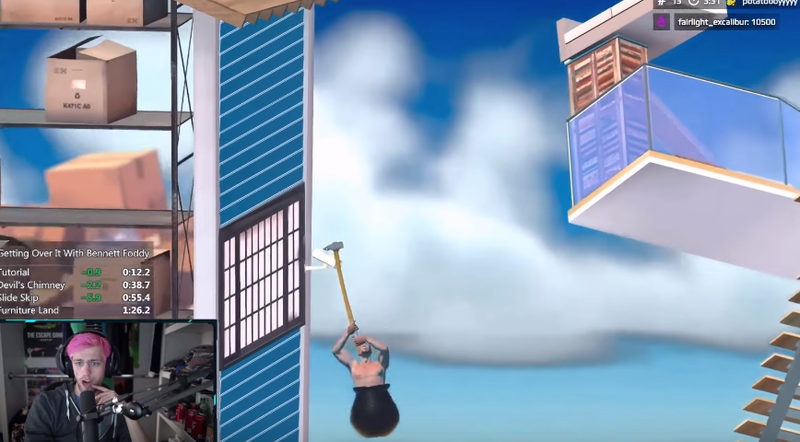 Last week, I wrote about popular streamers rage-quitting Getting Over It, a game about climbing a junk mountain that represents digital content and probably also Hell. Now for the flipside of that coin: people being extremely good at the game... being watched by people who are extremely bad at it. Getting Over It’s speedrunning scene is something else. Already, people have managed to finish this twisted, black-hearted vampire of a game in just over three minutes. For normal players, it can take tens of hours, if they even manage the feat at all. Speedruns by folks like Lumonen and Bao Bao have left streamers, some of whom previously rage-quit the game, slack-jawed. He’s right about one thing: speedrunners clearly aren’t human. They’re better. So now you’ve seen streamers rage-quit Getting Over It, other people speedrun it, and streamers watch those speedruns and rage-quit anew. The digital content snake has eaten its own tail and then some, all thanks to Getting Over It, a game laced with pointed commentary on digital content. I strongly suspect this was the point all along.